Four people from The Cord gathered together to make and taste-test three holiday-themed beverages to see which ones worked the best. The key was to see if these were drinks that we would drink again, that we’d pay money for and if they were worth the effort to create in the first place, especially given our busy and time-consuming schedules as students approaching exams. Looking to the McCormick website, we took a “Spiced Caramel Apple Cider” recipe that we altered to suit the ingredients we had one hand. With a prep time of five minutes and the addition of whipped cream and caramel drizzle on top at the end, it was definitely the most unexpectedly tasty drink out of the selection. We then heated it to a simmer in a pot and served from there. It made about four mugs worth of the drink and tasted tart and very sweet. The next recipe we followed much more closely and it was taken from the Ashlee Marie website whose namesake clearly know a thing or two about making hot chocolate. That said, this drink was called “The World’s Best Hot Chocolate” and serves roughly five people. From there, we followed the remainder of the instructions by mixing the ingredients as directed in a saucepan. This drink was very different from the first one, but it still turned out tasting amazing and seemed to be the favourite across the board. We added whipped cream and dark chocolate chips as the finishing touches, and that made all the difference. Comforting, chocolatey and definitely something you’d want to sip on just before Christmas. The last recipe we tried was from the website Port and Fin called “Maple Cinnamon Latte.” This recipe serves one and was changed slightly to include lactose-free milk and more maple syrup. An important note is to consistently monitor the drinks when being heated to prevent over bubbling and also that the heat is not too high. The sugars will caramelize and create solid bits at the bottom of the saucepan and should be poured through a fine mesh strainer into a mug. This drink was also pleasing to taste, but the chunks of cinnamon that floated at the top congealed together, making it a bit lumpy to drink. The flavour was delicious, the consistency was the only downside and none of us could taste the maple syrup at all. If anything it just made it taste a bit sweet, but not maple-y. 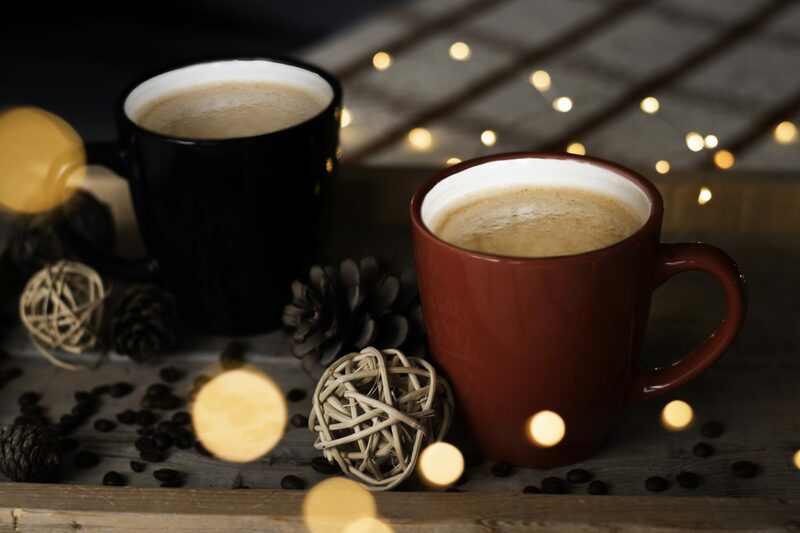 In order to jazz up your holiday drinks you can also add liquor such as Baileys or Kaluha and decorate the top for cafe style personalization with sprinkles, candy canes, marshmallows or cinnamon sticks, as desired.